Abstract: The 3" thick display panel takes up only a fraction of the desk space of an equivalent 50LB monster 19" CRT monitor. A large 19" LCD screen is great for office work and takes up much less room than a comparable CRT monitor. LCD's can only display 16.7 million shades of colour however. 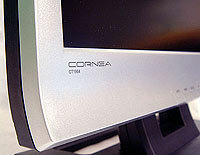 Cornea face a lot of competition in the LCD marketplace these days. As companies like Viewsonic, Samsung, and LG compete for our shopping dollars, Cornea Systems has opted to price their products very competitively to compete. Retailing for under $700USD, the Cornea CT1904 is priced like a value-oriented monitor, but doesn't quite have that feel to it. The display is nice and clear, and our test unit showed virtually no visible defects whatsoever. The general appearance of the monitor, and front bezel were quite nice also. With a native resolution of 1280x1024, a contrast of 500:1 and a brightness value of 250 nits, the CT1904 has a lot going for it. Gamers will appreciate the 25ms pixel response time which is good for an LCD in this price range, but not above the typical standard. I would have expected a response time of around 30-35ms given the price class of the CT1904, but Cornea seem to understand that such pixel response time can put off gamers who dread "ghosting". Brightness and colour saturation were also nice on the display, there was no uneven colouration that we could detect on the solid colour test screens. A quick test conducted by quickly moving a webpage of text up and down quickly also confirmed that there was no visible blurring or streaking of the display. LCD's with a slow pixel response will often fail this test by showing a reddish blur, or after effect around text as the screen is moved up and down and pixels rapidly switch on and off. While it would have been more useful to have the headphone jack located on the side or bottom of the display panel where it would have been more accessible, and speakers which were actually directed forward, the Cornea CT1904 has still came out well. It did so largely because of the screen quality, which tested well, and remained visually appealing. More refined 19" LCD display are certainly available on the marketplace, but for this units price range it is more than well suited to desktop use in the office or at home.